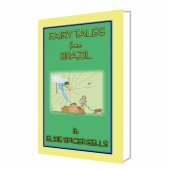 A GREAT READ FOR FANS OF INDIANA JONES AND ARMCHAIR EXPLORERS! 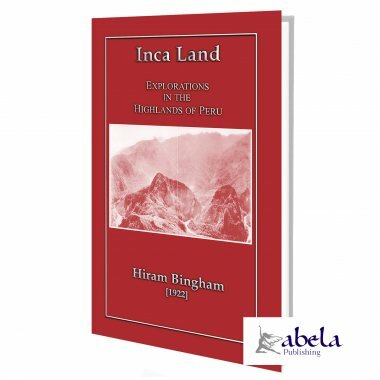 Made from the same mould as Indiana Jones, Hiram Bingham (1875 - 1956) was an academic, explorer, treasure hunter and politician from the United States. He obtained degrees from Yale, UCLA Berkeley, and a PhD. from Harvard. He taught history and politics at Harvard and then served as preceptor under Woodrow Wilson at Princeton. In 1907, Yale appointed him as lecturer in South American history. In 1911 he made public the existence of the famed Quechua citadel of Machu Picchu and the world has been captivated by the mystery and romance of the land of the Inca’s ever since. 2011 is the centennial year of Bingham’s famous announcement. This book has been republished, in part, to celebrate his achievement, but more importantly to raise funds for Project Peru which gives ongoing and practical support to those who live in extreme poverty in the desert shanty towns of Lima, Peru. 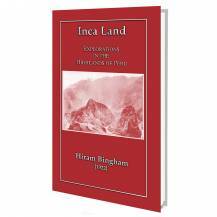 In the 410 pages of this book you will find some of the results of four of Binghams journeys into the interior of Peru. In the main these travels covered southern Peru, which took Bingham into every variety of climate and forced him to camp at almost every altitudefrom sea level to 21,703 feet. The Incas lived in this land of violent contrasts. In Inca Land one may pass from glaciers to lush tree ferns within a few hours. So also in the labyrinth of contemporary chronicles of the last of the Incasno historians go more rapidly from fact to fancy, from accurate observation to grotesque imagination; no writers omit important details and give conflicting statements with greater frequency. The story of the Incas is still in a maze of doubt and contradiction. It was this mystery and the romance of nineteenth-century exploration that first led Bingham into the relatively unknown region between the Apurimac and the Urubamba, sometimes called the Cradle of the Incas and to the fabled Quechua citadel of Machu Picchu. It was in July, 1911, that we first entered that marvelous canyon of the Urubamba, where the river escapes from the cold regions near Cuzco by tearing its way through gigantic mountains of granite. From Torontoy to Colpani the road runs through a land of matchless charm.  It has the majestic grandeur of the Canadian Rockies, as well as the startling beauty of the Nuuanu Pali near Honolulu, and the enchanting vistas of the Koolau Ditch Trail on Maul. In the variety of its charms and the power of its spell, I know of no place in the world which can compare with it. Not only has it great snow peaks looming above the clouds more than two miles overhead; gigantic precipices of many-colored granite rising sheer for thousands of feet above the foaming, glistening, roaring rapids; it has also, in striking contrast, orchids and tree ferns, the delectable beauty of luxurious vegetation, and the mysterious witchery of the jungle. One is drawn irresistibly onward by ever-recurring surprises through a deep, winding gorge, turning and twisting past overhanging cliffs of incredible height. Above all, there is the fascination of finding here and there under the swaying vines, or perched on top of a beetling crag, the rugged masonry of a bygone race; and of trying to understand the bewildering romance of the ancient builders who ages ago sought refuge in a region which appears to have been expressly designed by Nature as a sanctuary for the oppressed, a place where they might fearlessly and patiently give expression to their passion for walls of enduring beauty. Space forbids any attempt to describe in detail the constantly changing panorama, the rank tropical foliage, the countless terraces, the towering cliffs, the glaciers peeping out between the clouds. We had camped at a place near the river, called Mandor Pampa. Melchor Arteaga, proprietor of the neighboring farm, had told us of ruins at Machu Picchu. The morning of July 24th dawned in a cold drizzle. Arteaga shivered and seemed inclined to stay in his hut. I offered to pay him well if he would show me the ruins. He demurred and said it was too hard a climb for such a wet day. When he found that we were willing to pay him a sol, three or four times the ordinary daily wage in this vicinity, he finally agreed to guide us to the ruins. No one supposed that they would be particularly interesting. Furthermore, the view was simply enchanting. Tremendous green precipices fell away to the white rapids of the Urubamba below. Immediately in front, on the north side of the valley, was a great granite cliff rising 2000 feet sheer. To the left was the solitary peak of Huayna Picchu, surrounded by seemingly inaccessible precipices. On all sides were rocky cliffs. Beyond them cloud-capped mountains rose thousands of feet above us..
Hardly had we rounded the promontory when the character of the stonework began to improve. A flight of beautifully constructed terraces, each two hundred yards long and ten feet high, had then recently rescued from the jungle by the Indians. A forest of large trees had been chopped down and burned over to make a clearing for agricultural purposes. Crossing these terraces, I entered the untouched forest beyond, and suddenly found myself in a maze of beautiful granite houses! They were covered with trees and moss and the growth of centuries, but in the dense shadow, hiding in bamboo thickets and tangled vines, could be seen, here and there, walls of white granite ashlars most carefully cut and exquisitely fitted together. Buildings with windows were frequent. Here at least was a place far from town and conspicuous for its windows.